Many of us work with the mindset that if we accomplish certain goals, happiness will follow. If I lose weight, if I get a raise, if I get a different job, then I can be happy. 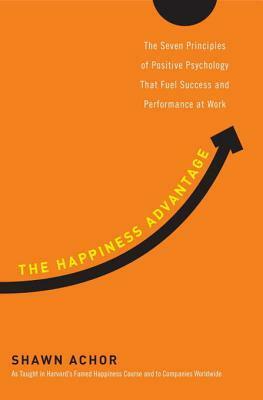 But recent research in the field of positive psychology shows that happiness fuels success instead. When we are positive our brains become more engaged, resilient, energetic, and productive. In his book, Achor describes a significant amount of research supporting this conclusion, and recommends certain guidelines and practices that can help increase our positivity and as a result, our success. This is a great read for anyone although it is targeted at business readers. The "Seven Principles" he describes sometimes include common-sense advice you've heard before (such as tackle smaller problems first before moving on to bigger challenges). But I appreciated that Achor's information was reinforced by many examples and studies. Beyond this, simply reading the book and actively thinking about positivity for an extended period of time had a marked effect on my productivity and outlook. The audiobook is narrated by Achor himself and goes a bit slow. I'd recommend increasing the speed a bit as you listen. I appreciated the way Shawn Achor presented the information in this book. The examples and studies he provided helped reinforce his claim that you need to find happiness first and then success will follow. What really resonated with me is that you can train your brain how to be happy. Sometimes we get stuck in our normal way of processing situations, without consciously being aware of our outlook. He offers practical advice, not just for business, but for everyday life. I plan on listening to this book again, but this time taking the time to really implement some changes in my life.